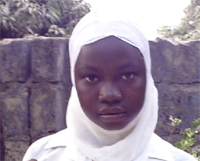 " I want to be a nurse or a journalist in future to support my country. " I am very happy that I am selected in the sponsor. It is very nice because it will help me a lot. It is very important to me. I am attending Muslim S.S.S. I want to study up to the university level, if I have the sponsor. I am thanking you so well. I hope your support will continue for achieve my aim. I want to be a nurse or a journalist in future to support my country.